Kolodny describes hate mail, death threats by angry pain patients. 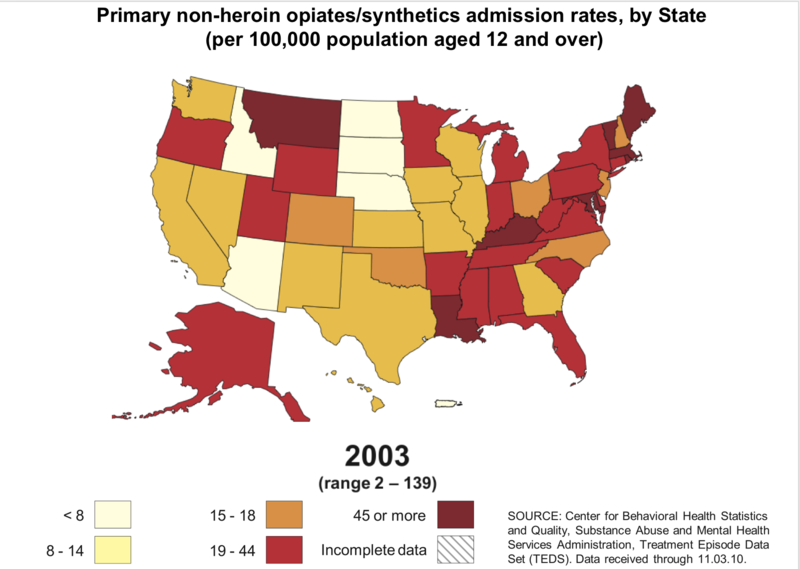 Epidemic started in 1996, with unprecedented marketing campaign for OxyContin. False "unbranded marketing," minimizing risks of opioid painkillers, boosted sales of all prescription opioids. A wiry man with close-cropped black hair, Kolodny is comfortable in the arena, mixing it up, giving offense, and taking heat—including, lately, death threats. At Brandeis he has been co-director of the Heller School’s Opioid Policy Research Collaborative since November 2016, but it is his role as co-founder and executive director of the advocacy group Physicians for Responsible Opioid Prescribing (PROP) that stirs white-hot emotion—among pain patients who fear being cut off from their legal supply of opioids. (Kolodny says he has always opposed cutting patients off their medication, and that these patients have been misled.) He has also served as Chief Medical Officer at Phoenix House, chair of psychiatry at Maimonides Medical Center in Brooklyn, and an official with the New York City Department of Health and Mental Hygiene. TORI: How did you get involved in the opioid epidemic? Kolodny: In July 2003, after I finished my psychiatry residency at Mt. Sinai, I got a job in public health working for the New York City health department. Tom Frieden had just become the city’s health commissioner, and Mike Bloomberg had just become the mayor. Frieden [who later became President Barack Obama’s director of the Centers for Disease Control and Prevention] was especially interested in improving health outcomes in the city’s poorest communities. So on my first day on the job, I was given the assignment of reducing death from drug overdose in New York City. I have basically been working on that assignment ever since. At that time, drug overdose deaths were almost entirely in the poorest neighborhoods, which had been hit hard by heroin in the ‘70s and by crack cocaine in the late ‘80s, early ‘90s. 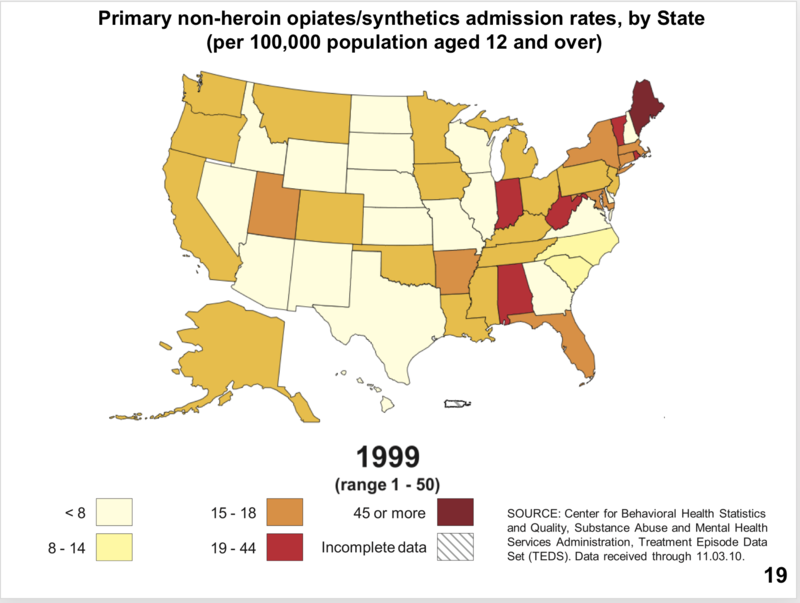 Most deaths were heroin overdoses. We wanted to make buprenorphine treatment more available. It was very difficult. You had to take special training to prescribe this medication and doctors felt that if they took that training they’d have addicts in their offices. And why would they want those people there? I figured I ought to practice what I preach. I started my own clinical private practice, got certification to prescribe this medicine, and thought I would be treating people from New York City’s poorest neighborhoods. That’s not who was coming to my office. It was mainly white people from Staten Island, Long Island, New Jersey, Westchester. They were in their 20s through 70s, and they’d all become addicted through prescription opioids. This was around 2003-2005. During that same window, I was seeing reports coming out from the federal Drug Abuse Warning Network from other parts of the country. At first I didn’t even believe it. I remember looking at one report and I seriously thought a decimal point had been put in the wrong place. But it was real. We were at the beginning of the opioid crisis. In 2006 I started a new job at Maimonides Medical Center in Brooklyn. That year a paper comes out by Leonard J. Paulozzi, the then-medical director at the injury prevention center of the U.S. Centers for Disease Control and Prevention (CDC). 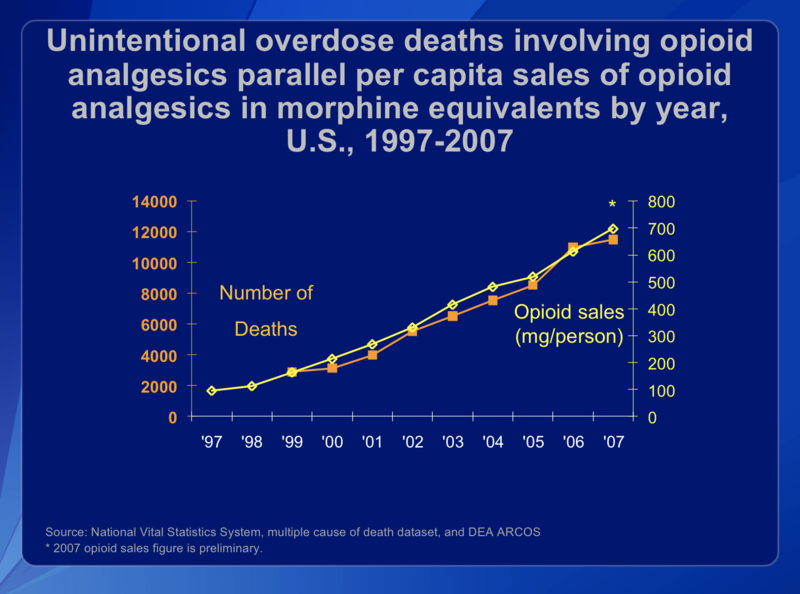 [By 2002 overdose deaths from prescription opioids analgesics had overtaken deaths from heroin or cocaine overdose, Paulozzi reported.] He charted out deaths from prescription opioids and sales of prescription opioids and saw that they were going up together. When did the prescription opioid epidemic begin? It began in 1996. [That’s the year Purdue Pharma began marketing OxyContin ER, a powerful, time-released form of oxycodone.] That’s when prescribing really takes off. In 1996 morphine takes off, too. And hydromorphone (like Dilaudid). 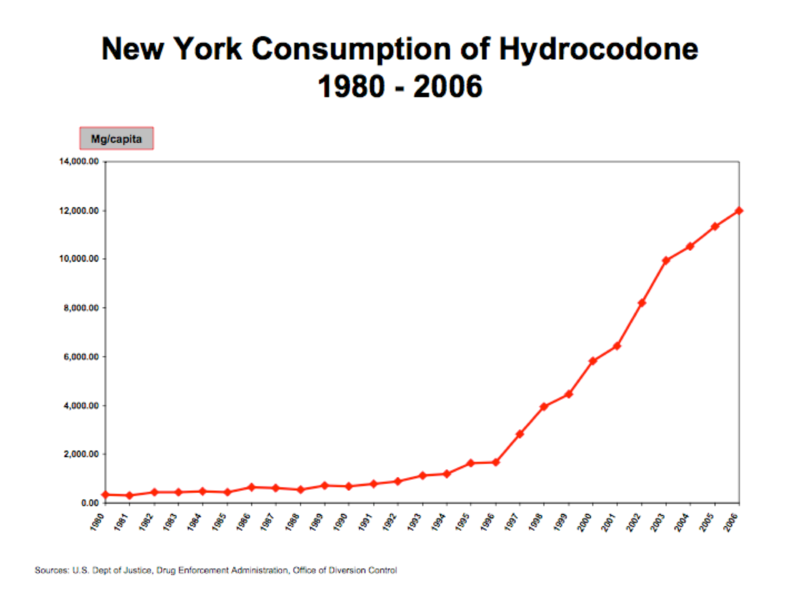 For all the opioids, 1996 is the year that the prescribing really just explodes. OxyContin hits the market in 1996. But all of them go up. Why is that? And I think the best answer to that question comes from a [U.S. General Accounting Office (GAO)] report published in 2003 that looked at what Purdue was up to when they introduced OxyContin. 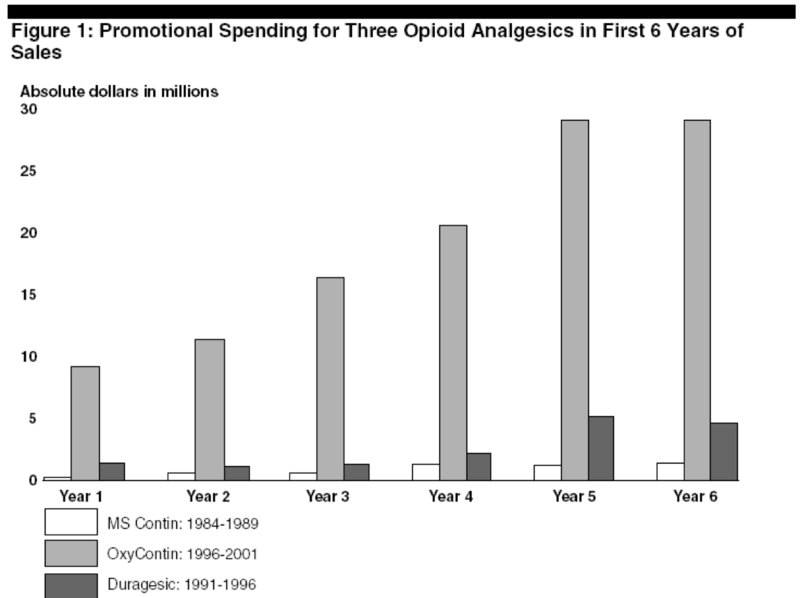 This is a graph from the report showing how much they were spending compared to earlier narcotics advertising campaigns. Now you could look at this and ask: This is about OxyContin [oxycodone]. So why did Vicodin [hydrocodone] and morphine and Dilaudid go up? 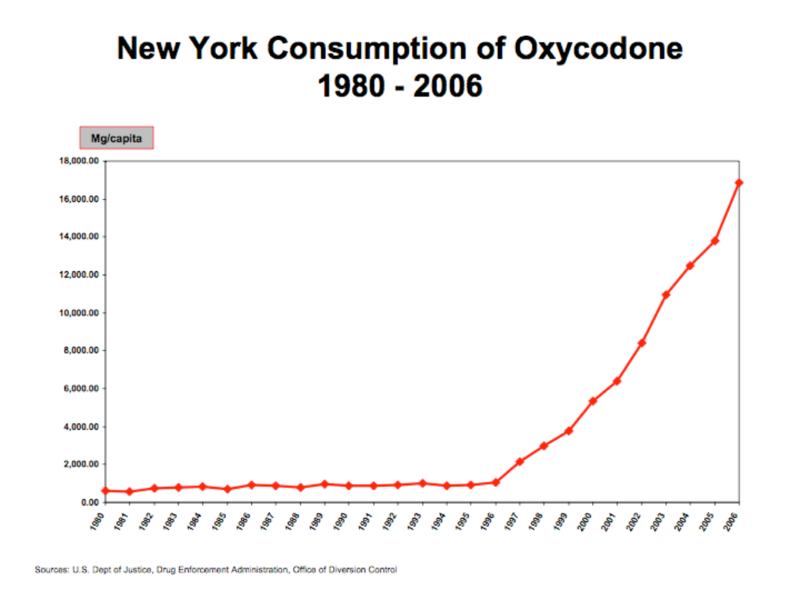 Why wasn’t the increase limited to oxycodone? And they answered that in this report. The bulk of what Purdue was really up to was focused on getting the medical community to feel comfortable with opioids as a class of drug. Exactly. Now they got into trouble for the misbranding in 2007. That’s what they paid the big fine for. [Purdue pleaded guilty to misbranding that year and paid $634.5 million.] But they never got into trouble for the worst of what they had done, which was the non-branded stuff: getting the medical community to believe that opioids were safe and effective for longterm use, and that the risk of addiction is very low. They’re getting into trouble for that now. That’s the basis of the litigation that’s been filed by the municipalities across the country. 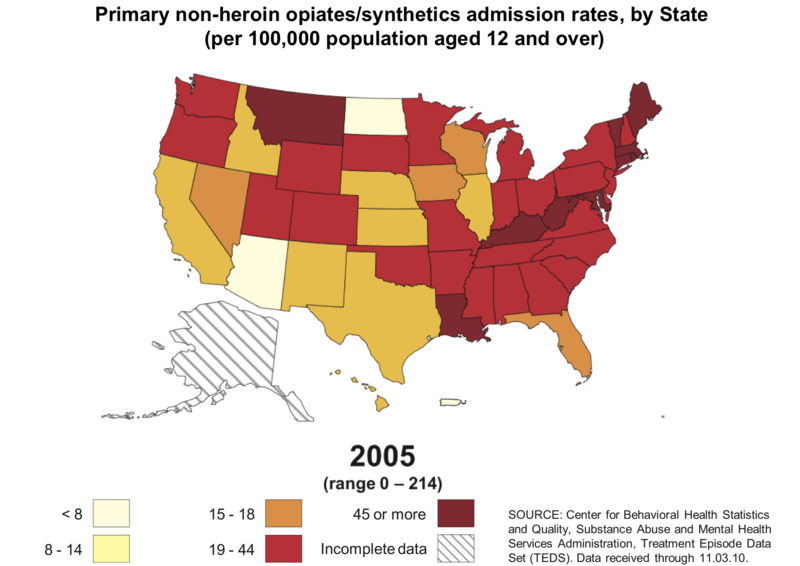 Opioid addiction is rare in pain patients. Opioids can easily be discontinued. And none of this is true. We didn’t just hear these things from sales reps. We were hearing these messages in CME programs. Purdue sponsored 20,000 CMEs in the first six years of the release of oxycontin. And we were hearing it from our professional societies, from our state medical boards, from every different direction. If you were an enlightened doctor in the know and wanted to be different from those puritanical doctors who were letting people suffer, you’ll know that opioids are a gift from mother nature and should be used much more. And as we responded to this campaign and the prescribing took off, it led to this severe epidemic that we’re dealing with today. Many of the lawsuits against opioid manufacturers today actually name prominent pain management physicians of the past—referred to in the complaints as “key opinion leaders”—as defendants in the lawsuits. Specifically they name Russell Portenoy, Perry Fine, Scott Fishman, and Lynn Webster, who also allegedly accepted money from manufacturers in the form of honoraria, consulting fees, and research funding. [Their attorneys declined comment on the suits.] These doctors aren’t accused of negligence, but of knowing false statements. Do you think that, at the time, they were making false statements knowingly? I think a lot of what they were teaching they may have believed. I think they would’ve realized a lot faster that what they were saying didn’t make any sense if it wasn’t in their financial interest to keep spouting this nonsense off. This is 1999, three years into the epidemic. 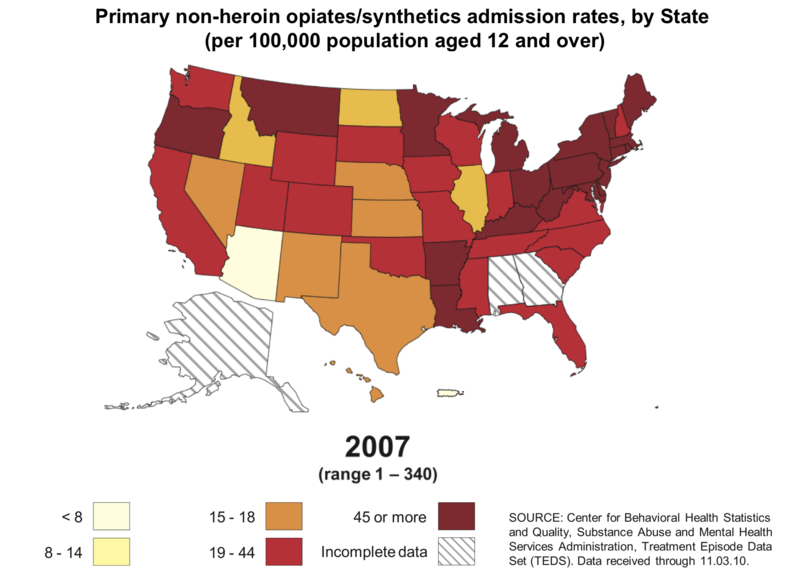 You’re looking at data from state licensed drug treatment programs. They have to ask you when you come in for treatment, what’s the primary drug you’re addicted to? 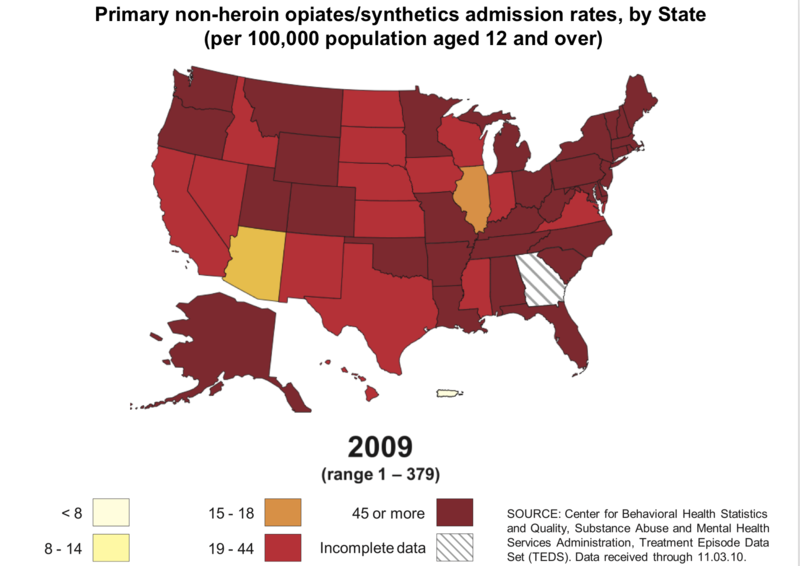 The states with the greatest number of people showing up addicted to prescription opioids show up as red or maroon. Just a few states are showing up as red or maroon. When you have a sharp increase in a disease over a short period of time, that’s the definition of an epidemic. Part II of the interview is published here. 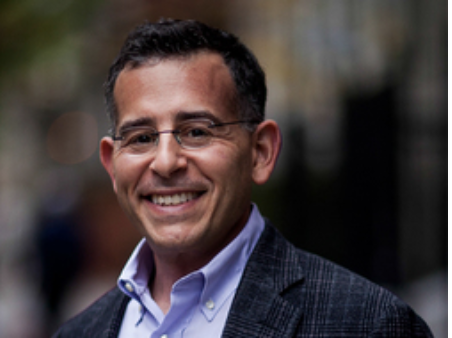 There Kolodny discusses the hate mail he has received; why he co-founded PROP; what categories of people are addicted today, and what can be done for them. Is denying inmates their methadone illegal? 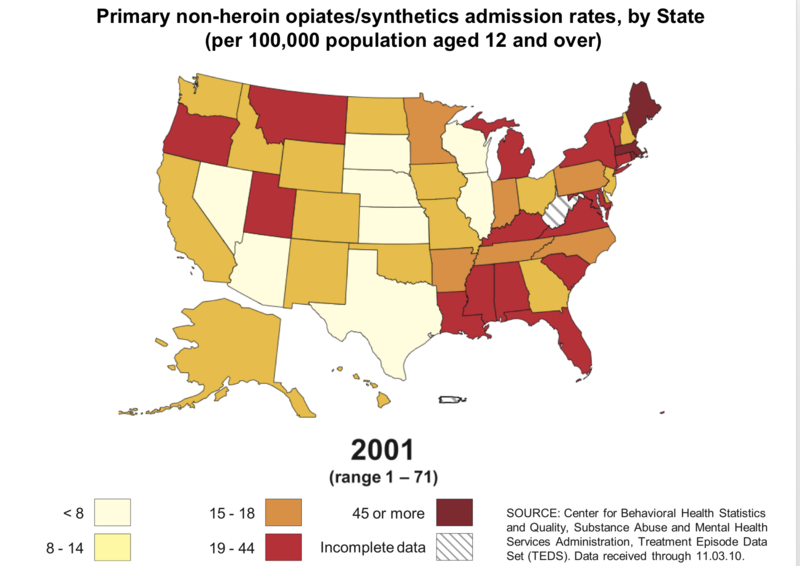 A truly compelling lawsuitOpioid use disorder vastly undercounted: Massachusetts studyPain doctors, advocates urge curbs on “forced opioid tapering”Drug overdose deaths decline for sixth straight monthUsing blockchain to fight the opioid crisis. What’s hype and what’s not?